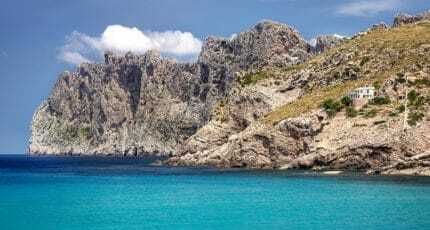 Cala San Vicente seduces visitors every summer with its three bays of sparkling turquoise water. The rugged cliffs of Formentor add an edge of drama to the sea views, which can be enjoyed from the terraces of beach front restaurants. The majority of cafés and eateries here are dedicated to Mediterranean cuisine. Fresh fish and paella are naturally in high demand, while contemporary Mallorcan dishes will give your visit a seal of authenticity. If you’re seeking flavours from beyond the island, you’ll find more choice in neighbouring Pollensa or Alcúdia. Enjoy beautiful sea views from the terrace of this boutique hotel. The restaurant is open to both guests and all those wishing to make the most of the picturesque bay. Attractively-presented dishes of Mediterranean cuisine can be found on their à la carte menu. A deliciously chilled vibe pervades this Spanish restaurant on Cala Barques beach. Chequered table cloths flutter in the sea breeze and the smell of freshly grilled fish and paella fills the air. In the summer months, your meal may be accompanied with the melodic beat of a live Cuban band. Fresh fish and seafood are the specialty of this cosy Mallorcan restaurant overlooking the bay. Wood beams and fishing basket lamps add a charming rustic touch. It’s an ideal place for a leisurely lunch of paella with an uplifting sea view. For a casual lunch away from the sand, this Italian restaurant offers an extensive list of Mediterranean favourites. Pizzas, homemade pastas, salads and grilled meat all feature on their crowd-pleasing menu. Not fine dining, and yet a seat on their welcoming terrace may prove to be satisfying experience. Mallorcan gastronomy with a contemporary twist is the focus at Hotel Cala Vicenç. The decor emphasises this theme with colourful tiles and traditional ‘robes de llengües’ fabrics paired with Nordic style furniture. Choose to dine in the attractive interior or al fresco beside the pool. Many of the restaurants in Cala San Vicente only open during the summer. Once the picturesque bays start to fill, it’s time to book a table. We hope you have found this article about the Cala San Vicente Restaurants useful and that you have many memorable stays in Mallorca as a result of our recommendations.